A well-designed and implemented SEO campaign will drive organic traffic to your website and raise the visibility of your business on the internet. This is achieved by optimising your website’s content so that it ranks higher on search engines – ideally landing it on the first page of results. Think of how many clients you’ve missed out on simply because they never found your website after a Google search! Achieving good SEO results requires a solid ongoing commitment and depending on the size, complexity and quality of your website it may take anywhere from a few months to 6-9 months until meaningful and solid results are obtained. 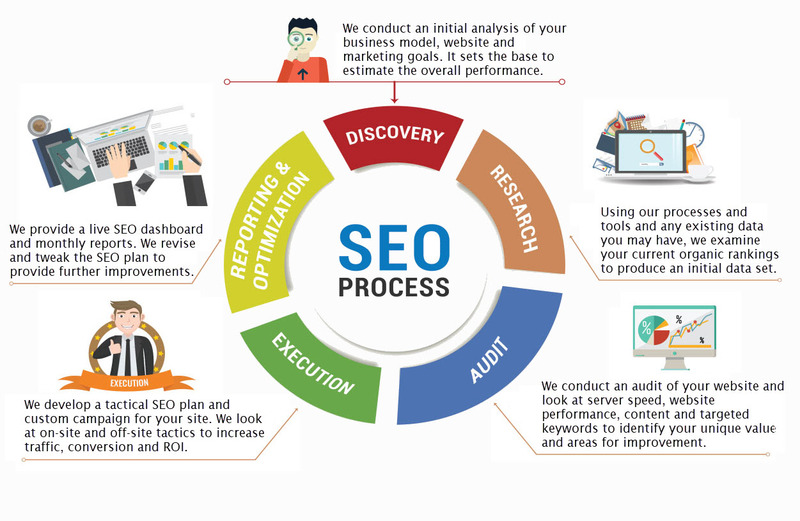 There are no quick fix solutions and tools, it simply requires time, dedication and investment to traverse through all the aspects and signals to improve your SEO. Analyze the current website structure and frequency of indexing from Google. Assess the existing inbound and outbound link volume on website. Review the internal linking process in website. Analyze the Header tags and Meta tags as seen by Google. Evaluate the Webmaster Tool Account to determine any potential obstacles in progress. Check the exiting website traffic and the keywords which bring organic traffic. Assess the frequency of content updates/additions. Review content as it relates to the focused keywords. Identify improper URL names and dynamic pages. Review the robot.txt and existing site maps for updated frequency and accuracy. Check the existing age of domain. Analyze competitors in the primary keyword verticals. Evaluate the existing keyword rankings. Analyze the targeted keywords to create a list of keywords which will be targeted in the SEO campaign based on competition, popularity of search and relevancy to website. Evaluate the changes required in the website in terms of the structure or architecture. (Site hierarchy, URLs, site map, Meta tags, Header tags etc.). Determine the need for extra content on the website and how comprehensive this content needs to be. Craft a comprehensive link building strategy focused on different link sources such as competitive link analysis, guest blog posts, press releases, relationship outreach, wiki posts, broken link opportunities and additional sources. Create an “Action Plan” for starting the SEO campaign. Formalise strategy and tactical plan with the Client Account Manager. Finalize the focused, primary and secondary keywords to be targeted. Implement the “Action Plan” as stated in Phase 2. Your Account Manager will be available for any questions/concerns. Every month, you will get a detailed report of the inbound links developed and tasks performed, accompanied with comprehensive organic analytics and rankings improvement from the previous month. We will do a follow-up monthly call to discuss the SEO results from the previous month and review the “Action Plan” for the next month. Every client will be provided secure access to our SEO Dashboard so you can monitor analytics, keyword rankings and performance metrics in “real-time”. How is Net Solutions different to other SEO agencies? Unlike other SEO agencies, Net Solutions is more than a digital marketer. We are able to offer Advice and Consulting on Digital Marketing, Software Development and Programming, and everything in-between. Yes, we actually fix up any technical SEO issues that may exist on your site, right down to debugging code. Many of our clients come to us from other SEO agencies. These agencies often sign you up to a high retainer, but later on you find that the retainer does not include other resources such as software engineers, developers and programmers. Net Solutions provides all the skills as necessary to diagnose and remedy the various issues that can impact on your sites traffic. It's all part of the SEO package. If you want to target more popular keywords you’ll need a bigger investment. If you want to get on top of your competition you’ll need to invest more than they are. SEO services can be upgraded or downgraded or cancelled at any time, there is no lock in contract. Ideal for small business targeting 10-20 keywords in 1 location or region. Ideal for small/medium business targeting 20-30 keywords in 1-2 locations. Ideal for medium business targeting 30-40 keywords in 1-5 locations. All businesses are different, and have different goals, so many factors come into play including baseline traffic, website architecture, domain age, geographic location, content, competition, and target market. All will impact on the time-line so the right choice in plan will be based on how much time we allocate each month to perform the required SEO tasks. SEO is a long haul process. It needs to be planned out carefully using only white hat SEO practices to get long-term success. In our experience, any SEO provider who tells you it will take a year, then precedes to lock you into a 12-month contract probably isn’t going to get you great results, no matter how long you give them. For this reason our Plans are a month on month commitment. Our monthly reports give you a clear indication of the tasks we have performed and tasks that we need to perform going forward. If you are interested in learning more about how our SEO services can assist you, give us a ring, drop us an email or fill out the contact form.